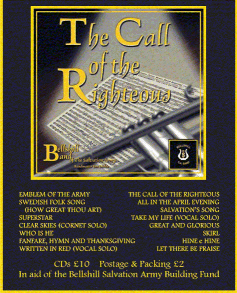 The Bellshill Band of the Salvation Army (Bandmaster Ian Dickie) officially launched its new recording, The Call of the Righteous, with a concert on 23 April 2005. Because of the overwhelming interest in the event, the concert had to be moved from the Salvation Army hall to the neighboring Macdonald Memorial Church. An estimated 400 people attended. The concert featured five items included on the recording: Emblem of the Army, The Call of the Righteous, Skirl, Salvation’s Song, and Fanfare, Hymn and Thanksgiving. Vocal soloists Gemma Gunn and Olwyn Mathie sang Take My Life and Written in Red, both of which are also included on the disc. The Bellshill Songsters also participated in the program, singing Count Your Blessings and Standing on the Promises, and the timbrel brigade as well, presenting Go Down Moses. Bobby Watt, a piper, joined with the band for Highland Cathedral. The Deputy Bandmaster, Melvyn Shanks, gave a devotional. The evening finished with a cup of tea and “Tunnocks” produce, graciously donated by Boyd Tunnock, who was present at the concert. For details on how to order the Bellshill Band recording, visit the band’s web site at Bellshill Band. This article was posted in New Releases, News, Recording and tagged Bellshill Band, Bellshill Songsters, Bobby Watt, Boyd Tunnock, concert, Gemma Gunn, Ian Dickie, Macdonald Memorial Church, Melvyn Shanks, Olwyn Mathie, Recording on 5 June 2005 .